The engine is obvious - a Problem - and helps us to date the picture precisely as between December 1897, when the engine was rebuilt into its final form as here, and 1st January 1903, when centre lamp sockets were brought into use on front bufferbeams. But where is it? The buildings in the background and the gasometer on the right look distinctive. On the left is a wagon, which looks like LNWR 454, but the rest of the inscriptions are unguessable (by me anyhow), and beyond it is a carriage in a dark colour with white roof. The wagon on the left is definitely not LNWR. The axleboxes are the wrong shape and there is a long line of writing on the centre of the solebar - probably on an owners plate. Although the LNWR had wagons with rounded ends, they were lower than these. Probably the carriage is not LNWR either. Looking again there are several other features of the wagon which are very un-LNWR, like the type of door catches and the wheels. The rail chairs however do look to be of LNWR type. Could it be a LNWR location and a NLR wagon? As for the location - I havn’t a clue. There seem to be small piles of fine ash to the left hand side and the ballasting is poor, so perhaps an LNWR shed? The photo was taken at Blackpool, about three-quarters of a mile south of Central Station, looking north-west from just north of Bloomfield Road. The houses at the left and the gas-holder are identifiable from other photos. The carriage presumably belongs to the Lancs & Yorks Railway. I’ve no idea about the wagon. The advert on the gable-end seems to be for Kruschen Salts, a much-advertised cure-all in pre-NHS days, and maybe helpful after a week of boarding-house breakfasts. There are a number of interesting features of the wagon. 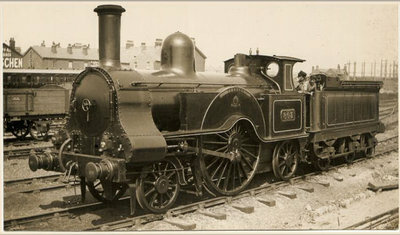 First the wheels are solid rather than open spoke; second the springs are unusual in being heavy-duty multi-leaf; the livery appears to be plain wood with dark or black ironwork; and the company plate appears to consist of two lines of letters sandwiching the numbers. While these are not individually diagnostic, when taken together they may lead to one conclusion. A North-Western origin ought to be excluded from the outset, since this axlebox-spring combination appears on no other wagon, and the LNWR company plate takes the form of large L.N.W. above the number, with no third line. The finish is also unlikely. On the other hand, LYR plates were ‘LANCASHIRE &’ on one line, then the number, with ‘YORKSHIRE RLY.’ below. The livery fits, and the company had its own design of eight-round-spoke wheel. The axlebox could be the Attock’s Patent, probably retro-fitted. I would suggest then that this is an example of the ‘high sided or coal wagon’ featured in “LYR Focus No. 2” by Noel Coates (p7), with a slight variation in the door furniture. The so-called ‘illiterate’ insignia may either have worn off or never been applied. There may be another wagon of the same type to the right, just visible behind the smokebox. The carriage is also LYR, being an arc roof all-third designed by Attock. The row of houses to the right of the advertisement are back-to-backs, shown by the chimney stacks dividing each side of the roof. Finally! — is that a stoneware bottle to the fireman’s left? The white roof and single colour of the carriage suggest it is possibly an NER carriage. It is difficult to see much detail but something about it suggests NER to me. The rail chairs are very like LNWR ones, but the LNWR didn’t have a shed at Blackpool.� Does anyone know whether the two railways used similar chairs?� Did the LNWR own anything at Blackpool, or was it purely L&Y? The lines into Blackpool were joint L&Y/LNW – the LNW had a one-third share. The loco shed from mid-1903 (i.e. after the date of the photo) was north of here on the east side. Maybe there was an earlier shed just left of the photo? The L&Y volume in the ‘LMS Sheds’ series by Hawkins & Reeve should clear this up, but I don’t have a copy. Most others have already guessed the location of the view as Blackpool. I grew up at No. 10 Westbourne Avenue which looked on to the carriage sidings and this view was taken about a hundred yards towards the engines sheds (north of my bedroom window) as I grew up looking onto the railway. The Fylde coast line was worked jointly by the LYR and LNWR but the predominant partner was the former company. Therefore although LNWR locomotives do feature in views of the area, they are rarer than the LYR ones. The view was taken in the morning as the light would be ‘head on’ around midday and not the best time to photograph locomotives at this vicinity. As the engine is facing south (towards Preston) it has obviously been turned and may be backing in toward the shed at the other side of Bloomfield Road over bridge for servicing before backing down to the Central station for a departure. Indeed, it could well have been serviced and be on its way to the terminus away to the right. The wagon is an early LYR wagon for which I am sure I have the GA drawing, and dates from before the 1895 diagram book was compiled. It has all the identifying features as recognised by others already. It was probably absorbed into Diagram 4 (which were 8 ton five plank wagons) at a later stage. The carriage is an Attock bogie full third in brand new condition. Few photographs show the white roof as it would not last long in service of course. The type were first introduced in 1894 but successive builds were made through into the new century by enlarging from 49ft to 54ft length and fitting in an extra compartment. So, my diagnosis is that the lovely locomotive has just arrived in the early morning or is about to leave on an early train. We are talking breakfast time with the sun so far round in the east. I have been in that very location so many times but I missed this combination by at least fifty years ! The Problem at Blackpool. The stoneware bottle contains the driver's (or fireman's) tea. It could be heated up on the coffee plate. Why is it so big? Because they worked a 14 hour day at that time. As a life-long tea drinker, Mike feels well qualified to answer this one.